I knew this would be an amazing wedding to photograph from my first contact with Hannah. 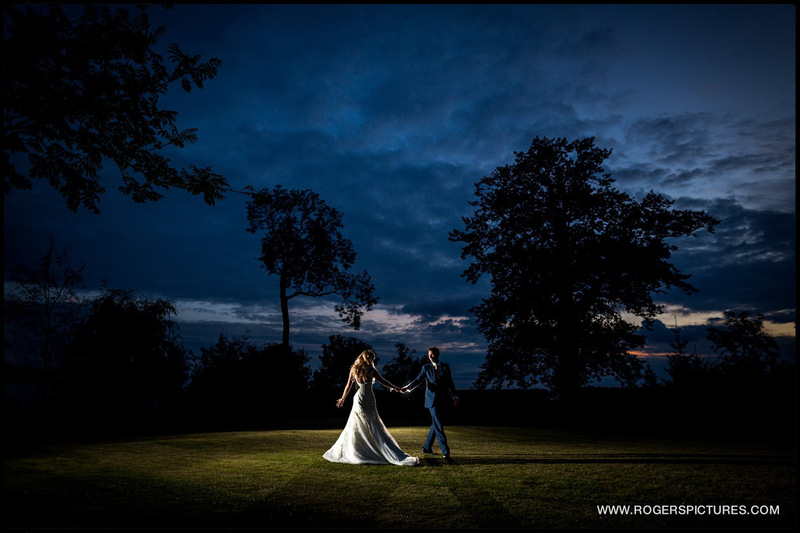 She asked me to be her Harpenden wedding photographer 18 months before the wedding in August this year. 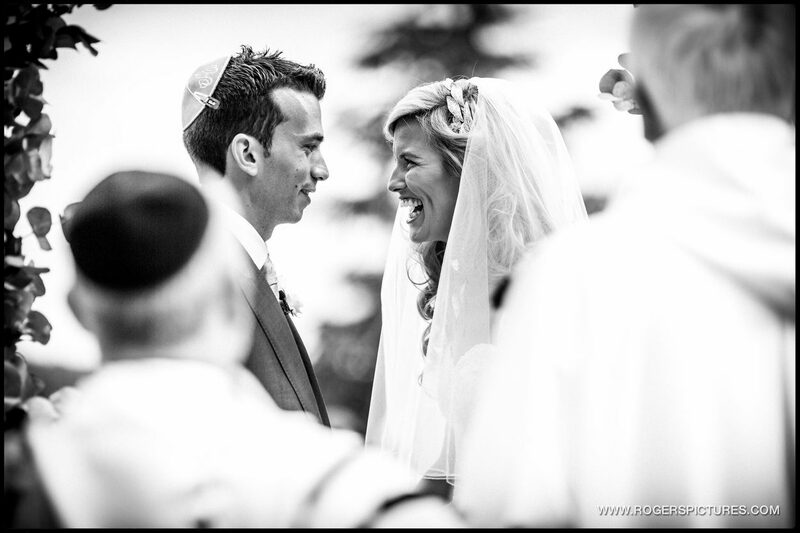 She and Simon were planning a Jewish – Christian wedding at her parents house near Harpenden in Hertfordshire. I could see the potential for an unforgettable party when I met Hannah there shortly afterwards. But it was the warmth and generosity of her family and everyone involved in the planning that made this wedding as spectacular as it is. I began by meeting Simon and the guys for their preparations at a local hotel. I joined a videographer from Bar Productions, before moving on to Hannah’s parents house for her preparations. The house and gardens were full of activity. The finishing touches were being put to the spectacular marquee and the ceremony area at the front of the house. Hannah and her bridesmaids were in the middle of their hair and make up, so there was plenty to photograph before the guests started to arrive. The interfaith ceremony was held under a Chuppah at the front of the house. The weather was kind, and the light great for photography. After the ceremony, we did a few family group pictures. Then we joined the rest of the guests by the pool , Hannah made a wonderful speech before the guests enjoyed some Cuban music. We set aside 15 minutes to shoot some portraits of Hannah and Simon on their own. Then we moved on to the marquee for the evenings celebrations. The guests had plenty of time to be ready for their arrival in the marquee. 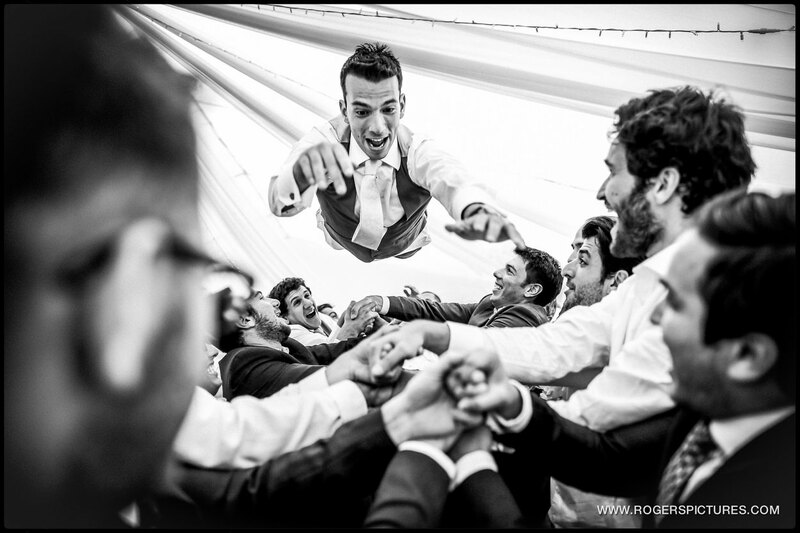 Now I’ve shot Israeli dancing before, and been to friends weddings in Israel. But getting in close to the action during this kind of dancing is always exhilarating as a photographer. It’s also pretty demanding, technically. It’s hard to convey the energy and excitement successfully in still images. I tend to take the great Robert Capa’s advice here, and use a wide angle lens to get in close to the action. The wonderful thing about a big entrance to the wedding breakfast, followed by half an hour of intense dancing is that it leaves everyone on a huge high going into the meal. You could almost touch the energy in the marquee as the evening progressed through the speeches and back onto the dance floor. There was a surprise Emirates shaped wedding cake for Simon, a big Gunners fan. Then even more dancing into the early hours. 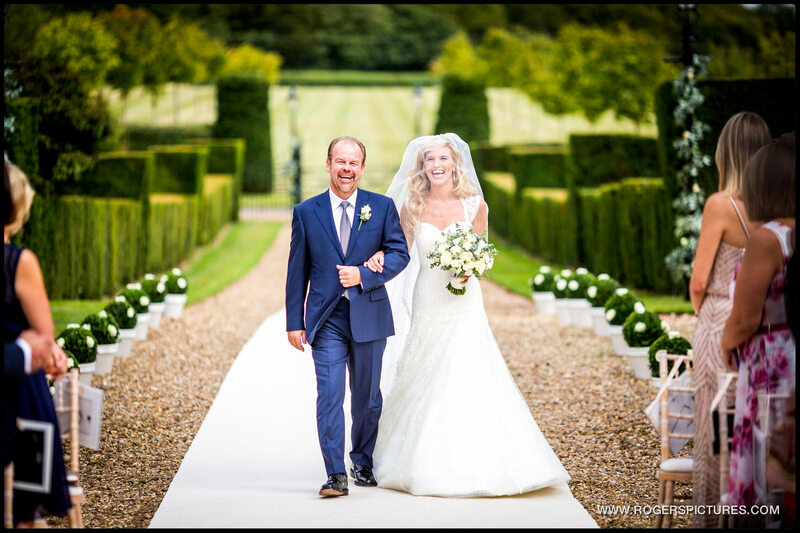 Credit to the many outstanding wedding suppliers that came together to make this one special day, particularly to the wonderful wedding Planner Louise Perry who pulled it all together. 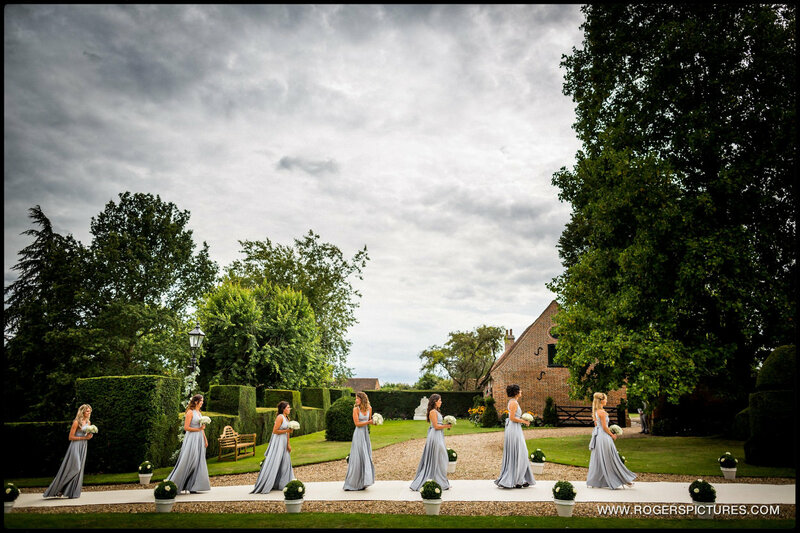 If you’re looking for a wedding planner, you couldn’t find anyone more professional and competent than Louise. 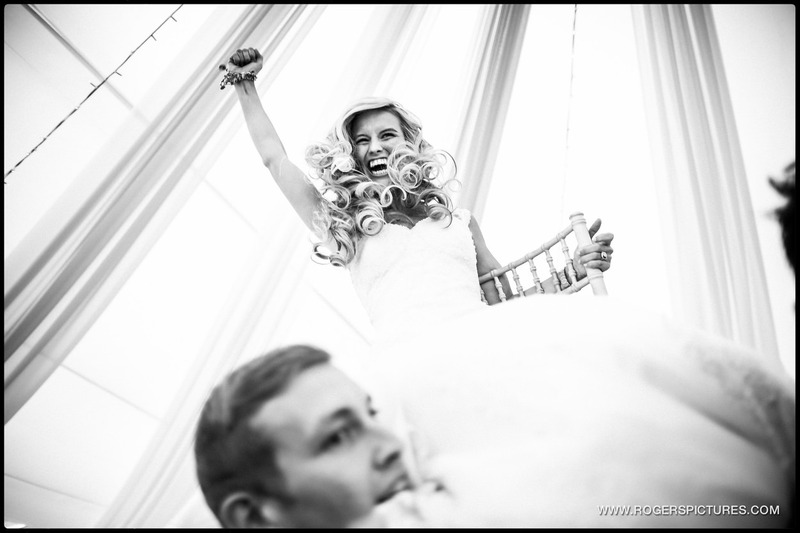 If you are planning a wedding and like the look of my style of relaxed, documentary wedding photography, please do get in touch to check my availability. 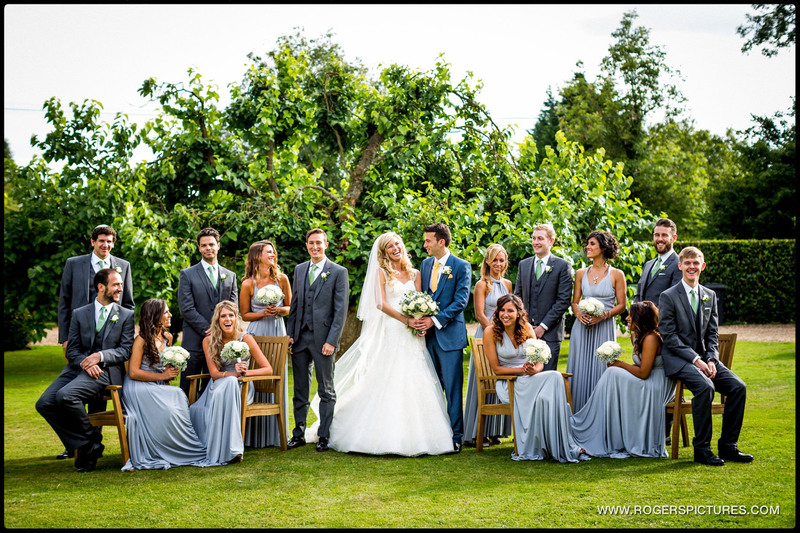 Or check out some more Hertfordshire wedding photography.